Cheers Tony. I finished the tuning myself too, as it happens. I agree it has that tuned down, full and rootsy La's vibe to it, where those little rockabilly-style bends and rhythmic patterns that ornament the songs sound that bit more dynamic and vivid. I just didn't understand those exact hz values listed at all. I've mostly being tuning my acoustic down a full step anyway, using a capo whenever needed. Also very useful when trying to find your suited singing key too. And doubly helpful when playing the different tuned La's songs. I tuned my guitar half step down, but listening to Son of a gun 's album version, I realised Lee's guitar seems lower . By the way, There she goes is in standard tuning 440Hz, right? The single / album version of TSG is standard tuning, yeah. The album itself is a bit odd, tuning wise. As in I think it's different from the Eden sessions (Doledrum on there is half a step down I think, but the album is raised up to standard). Most of it is standard, in fact, but Son of a Gun is a teensy bit lower. Basically, I don't think the tuning they used to play the album was kept ON the album. Well, that's what I mean. I understand why a record label would make it more uniform. But "doledrum", for example, Lillywhite inserted backing vocals from the standard-tuning Leckie session so I figure he fucked with it to make it more complete. The Eden sessions - the album sessions - were played by the band in a half a step down tuning. Overall, I'd say a ton of both recorded AND live La's IS in standard - or so close unless you have perfect pitch it won't matter. Eg, Kitchen tape. I don't think early (86-89) La's went outside tuning toooooo much. And from 90 onward, it was half a step down. I generally assume the 432hz is a tuning he found later to standardise the half-step-down vaguely-loose sound he was already aware of. And what's baffling is the 2005 gigs were in STANDARD. 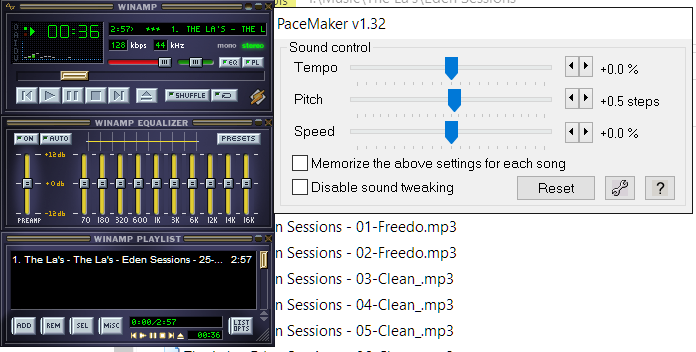 Honestly if you're on PC and playing along with MP3s or Flacs get Winamp and Pacemaker. You can change the pitch incrementally and you can harmonise to songs you can play. I play along to live gigs more than anything, and they're a mess in terms of uniform tuning.